This black shoe by BSI has a streak of grey flair that gives it a sporty look. 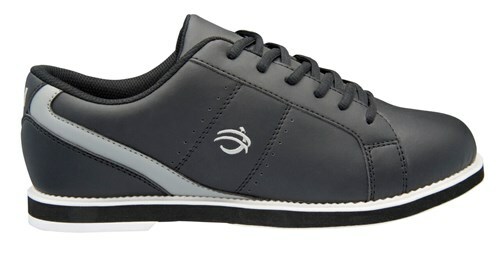 This is a basic bowling shoe that meets the needs of anyone looking for a shoe with universal slide soles. Getting your own pair of bowling shoes not only offers you style on the lanes but also save you on rental fees! Hello Troy! Yes, the shoes do have slide soles on both the left and right feet. This is what is meant by universal soles. These will be manmade leather. Due to the time it takes to produce the BSI Mens #752 Black/Grey ball it will ship in immediately. We cannot ship this ball outside the United States.